1. Get two freeze-burnt chicken breasts from the downstairs freezer. (Grab a can of chicken broth while you’re down there, too.) Thaw, but not all the way. They’re easier to chop if they’re a little frozen. 2. Heat up your wonderful pot from Target on the stovetop, add olive oil, add chopped up chicken. Add salt. 3. Chop up some onion & celery and throw it in. 4. Go to get some flour, then curse a little bit because you realize you left your flour at school. (The kids are making pancakes.) Grab some cornstarch instead. Mix a couple of spoonfuls in the broth and add to pot. Delight in the bubbling goodness. 5. Pour in half a bag of frozen veggies and some poultry seasoning (or something) and some more salt. Wait for it to come back to a boil. Let it cook while you check your e-mail and see what’s new at Neatorama. Note, 10 biscuits are about 4 biscuits too many for the actual filling, but who cares? Hey there, I was reading your article and I just wanted to thank you for putting out such excellent content. There is so much nonsense on the internet these days its difficult to find anything worthwhile. I actually have cooked this recipe before, I got this book last month on recommendation from a friend . I’m extremely eager to try your variation of it though, it looks excellent. I think you might enjoy those recipes, they’re very good. Thanks for the article and great ideas. How is it that I have not commented on this post? My comments are supposed to appear after every post on this website. 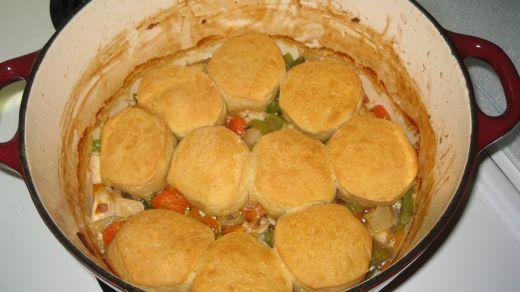 Mmm… now I’m craving pot pie. Do you think I could make this? I’m not a very accomplished make-it-up-as-you-go-along cook. I like to follow recipes to the letter. Cooking is more like chemistry that way. How did we miss this? But a spam robot found it? You’ve got some ‘splainin to do Lauren! I have no memory of writing this, so I’m no help to you. Haha! I love your addition to the comment ‘Margaret’ wrote. I think I love you. I found you through a link on a blog that I discovered on Stumble Upon. And you cook like I do. You THINK you have everything and discover, mid-process, that you don’t. So, you have to go MacGuyver with your cooking and figure out how to make it work. Even when you HAVE the stuff, you just wing it here and there.